Trump Conference squash investor hopes: What is next? 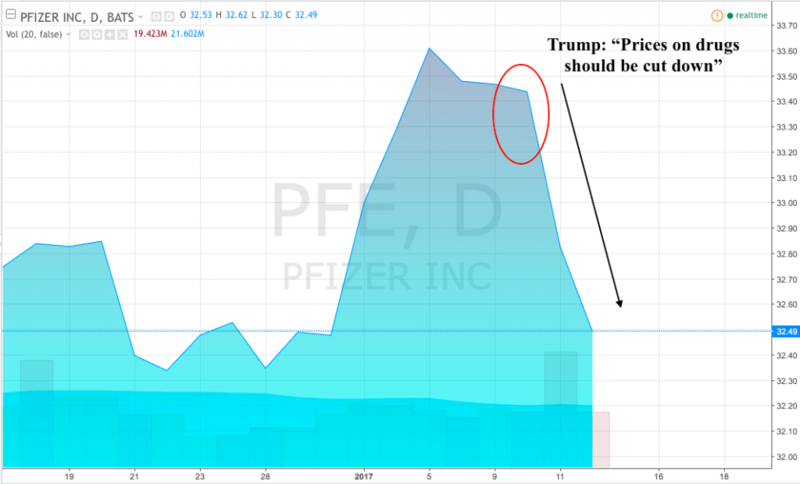 Newly-elected president statements also hit pharmaceutical companies as high prices on certain drugs became the object of critics of the President. As the government is one of the biggest buyers on some drugs Trump said price restrictions should be imposed to free up billions of budget money. Drugmakers shares fell. Leave your questions and comments in the comment box below. That’s it for now. We have also something special for you on US Dollar and Oil so stay tuned with Brokerarena.com! 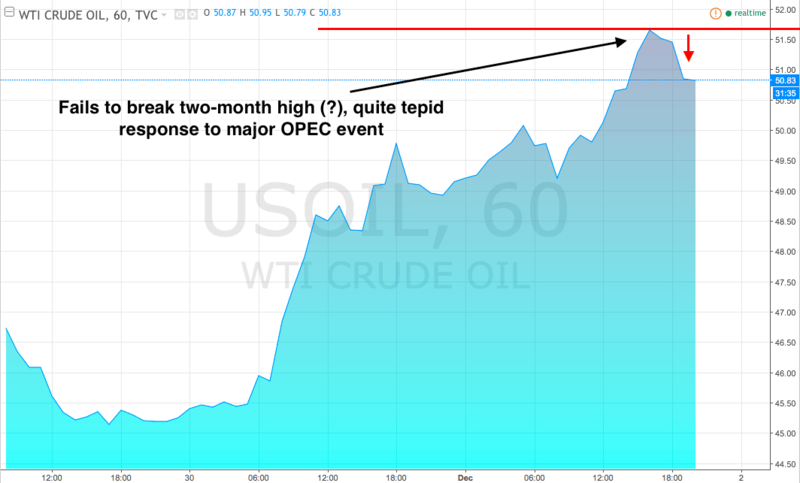 Oil market overview: Will prices go over $60? OPEC has pledged to cut output by 1.2 million barrels per day, while countries outside the cartel agreed to reduce daily production of nearly 600 thousand barrels. According to research by the Federal Reserve Bank (Fed) of Dallas, conducted in December, 58% of respondents believe that the OPEC agreement will not be honored in full extend. Less than 50% expect that the market will reach the oil supply and demand balance in the third quarter of 2017. The survey involved 147 energy companies. Among respondents 67 companies engaged in exploration and production, and the remaining 80 – service companies. Meanwhile, rising oil prices caused by the signing of agreements in OPEC helps to unfreeze shale production in the United States: the number of active drilling rigs increased from mid-2016 and has already equaled the levels of the beginning of 2016. According to the Energy Information Administration (EIA), in November, their number reached 401, the highest since January last year. That may be enough to start up production. Long positions on crude oil (green) rose over 600K while short positions fell steeply in December to 160K (purple). With such difference in bull’s and bear’s forces oil has good chances for renewing current peaks. Source: CFTC COT positions. According to EIA estimates, in the new year, production of raw materials in the US from shale formations will grow. The budget for the investment of American companies producing oil, rose by 13-20%, it said in the department report. Production of shale oil has reached its peak in March 2015 (5.461 million bpd) and is expected to be less than record by 919 thousand barrels in January. EIA estimates that the total oil production in the US will grow by 250 thousand barrels by the end of 2017. Significant risks to the stability of the OPEC agreement also creates growth in oil supply from Libya and Nigeria. So, in December, Libya has resumed production at two major oil fields. Meanwhile, the question of how the oil producers will comply with the agreements and how it will be controlled, remains open. 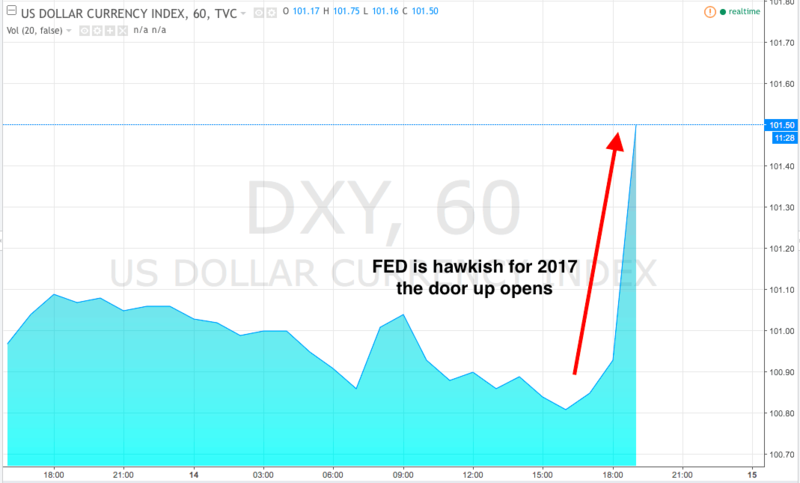 FED hikes the rate: Don’t miss unique trading opportunities! The US Federal Reserve raised its key rate by 25 b.p. to 0.75% and projected another three rate hikes in the following year. Despite a certain degree of “hawkishness” the FED cooled market enthusiasm saying that the monetary tightening implies gradual increases leaving themselves a room to adjust forecasts. It is highly likely that the policymakers will raise borrowing costs three times in the coming year. 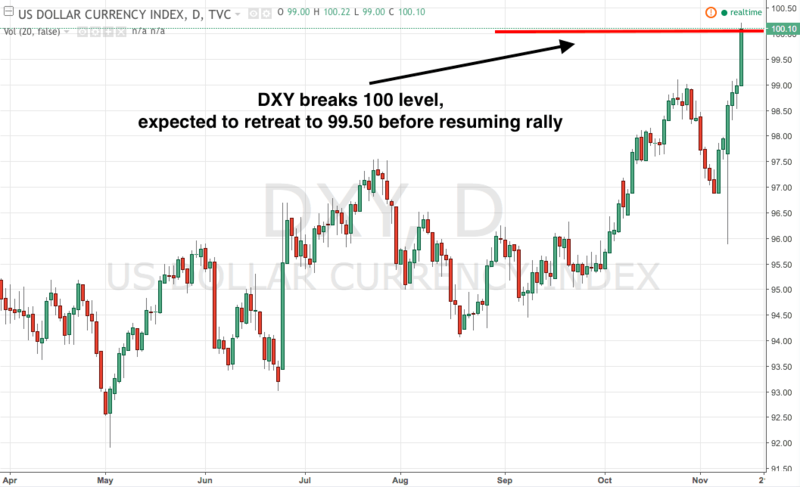 Markets was almost certain in December increase although reaction on US Dollar suggests some degree of uncertainty has been hovering in the air. US Dollar index soared more than half of percent posting biggest declines against Australian Dollar plunged together with commodity market. European currency and Pound also slid against the Dollar as the tone of Yellen speech appeared to be more than hawkish ensuring short term strengthening of the American currency. Oil plunged after short-term spike provoked by upbeat EIA US inventories data as stronger Dollar negatively affects Dollar-denominated commodity market. FED outcome also incited a rout on equity markets both in developed and emerging markets. Gold plunged due to the gloomy prospects of yields on the metal while Silver rose. Stay tuned with our updates to get free trading signals! So we have major updates on the markets which are greatly affecting attitude to risk. After Trump election US economy is projected to expand as the President pledged to increase fiscal spending (increase budget deficit to finance social, infrastructure and other programs which will spur economic growth and inflation. Gold and Bond markets plummeted while US Dollar grew over 14-year peaks. On Wednesday OPEC organization announced that members managed to agree on curbing production despite major discord between Saudi Arabia and Iran biggest oil producing countries in OPEC. The decision was quite expected despite many speculations as the countries which economy is based on oil exports have budget program greatly relying on revenue from selling Oil. These countries are Saudi Arabia, Russia Iran, Iraq, Nigeria, Venezuela and others. Market rebalance is essential for pushing prices up and stabilizing those economies. OPEC agreed to cut production to 32.5B barrels per day the target which were discussed at previous informal meeting in Doha. Russia supported the initiative as well as the energy minister Novak said the country will supply 0.3M less in 2017, although the cuts will be gradual. Many other oil suppliers backed the deal, also it remains unclear how dedicated to their promise will they be. For example Bloomberg analysts raised doubts that the members will stick to their promise based on the previous output cut agreements https://www.bloomberg.com/news/articles/2016-12-01/opec-history-shows-hard-work-on-cuts-deal-is-only-just-beginning. It’s clear that short-term advance on the energy market will be purely fueled by the optimism. 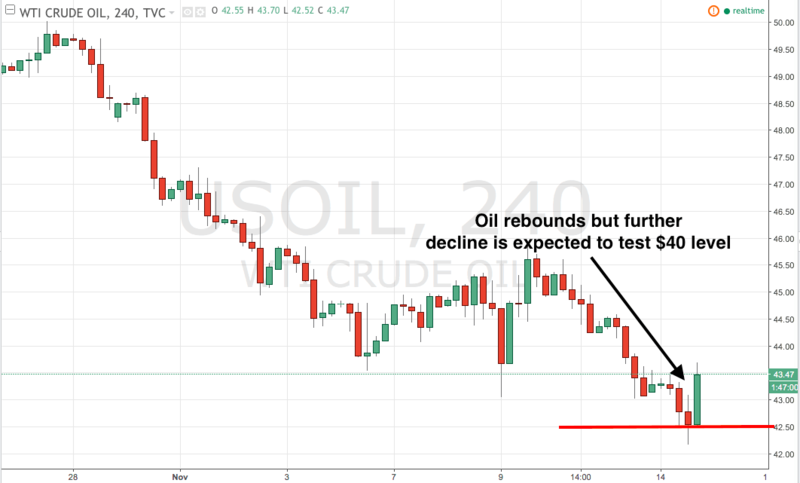 It will take time for the market to feel decreasing supplies and it gets especially tricky to bet on the oil in the long term and pullback in prices is quite possible if sudden disappointment strikes the market. In 1-2 next weeks investors will digest OPEC measure trying to gauge the extent market optimism will drive the prices. As for today prices added 3 percent – decent jump although, it is definitely hasn’t run out of steam and more bullish play is expected on the next week. It is going to perfect times to ride on Support and Resistance levels as prices isn’t likely to push through the resistance so easily. Next resistance areas on the WTI (US OIL) is $51.50, 53.00, 55.00 and 60.00 levels. The prices are not on the yearly peaks although $50.00 level is a good area for a take-off taking into account improving world economic conditions. There are another good news. And its for British Pound. 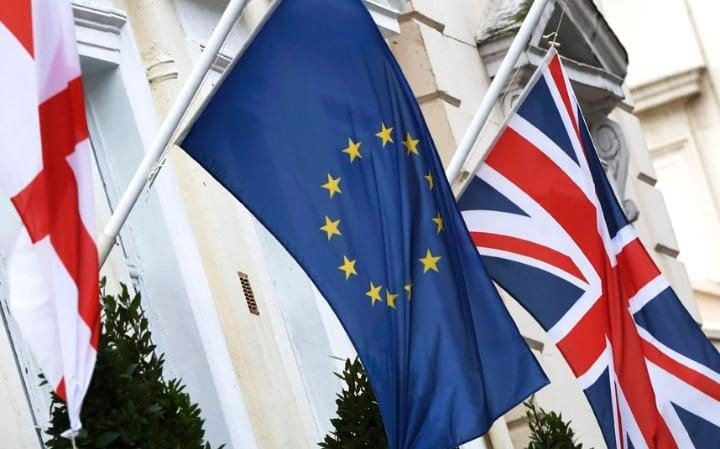 There are speculations that UK will retain access to European single trade market. Considering amount of exports from UK to EU (about 60%), losing European consumers will be a hard blow for UK manufacturers. There are rumors that UK will be forced to pay to EU to save this export channel, although these are only rumors and the Pound has been rallying accordingly – by 1 percent to 1.26 level. Leave your questions and feedback in comments! 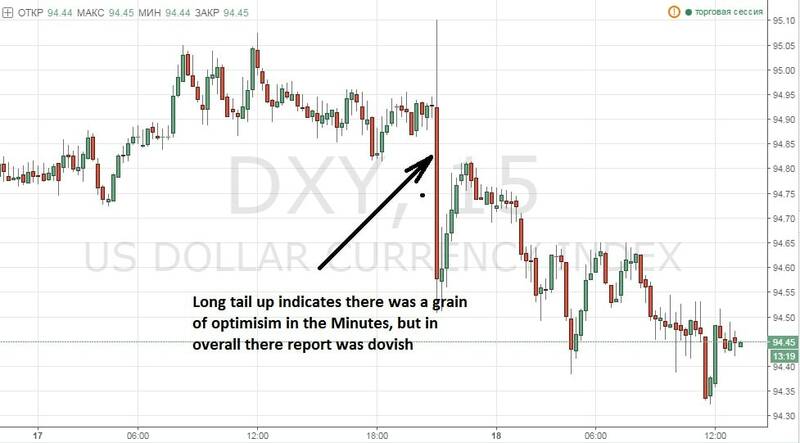 Market Outlook November 14: All rush into the Dollar. American currency strengthens growth on Monday reaching a 11-month high against other major currencies as optimism regarding the US economy during the presidency of Trump continues to support the demand for the dollar. EURUSD fell by 1.23% to 1.0722, the lowest level since January. 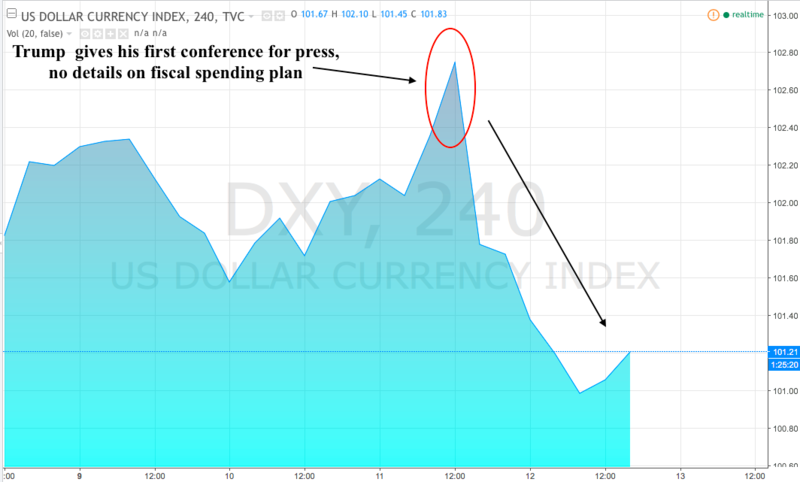 Dollar continues to rise on hopes that the upsurge in fiscal stimulus and tax cuts during a Trump administration can accelerate economic growth and inflation. The Expectations of raise of interest rates in the US have not changed amid optimism that faster economic growth would allow the Fed to increase borrowing costs. The Mexican peso remained under pressure, MXNUSD pair fell by 0.21% to 0.0480, keeping at a record low of 0.0467 on Friday. At a press conference last Wednesday the leadership of the Mexican central bank said that they keep an eye on fluctuations but refrain from any interventions. 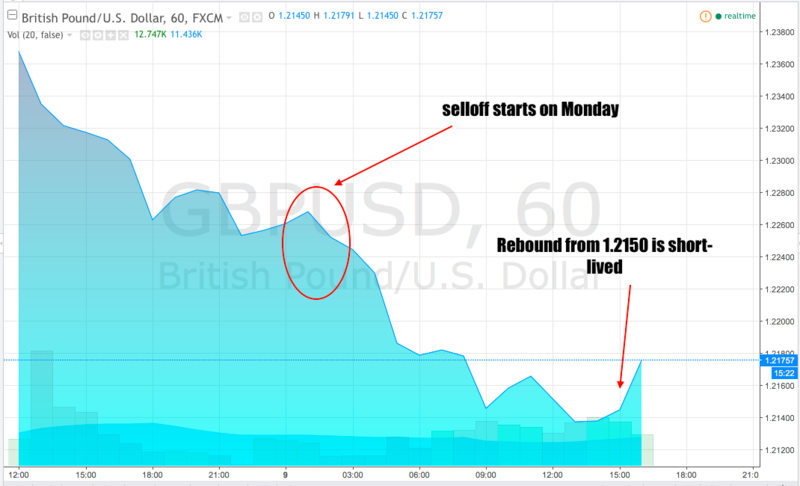 GBPUSD fell 0.99% to 1.2567, falling from a five-week high on Friday at 1.2675. Meanwhile USDJPY pair rose by 1.51% to 108.29, the highest since June 3, while the pair USDCHF has risen by 1.07% to 0.9987. Earlier in Japan, data showed that the economy grew faster than expected in the third quarter with GDP growth of 2.2% in annual terms, however, the report also pointed out that domestic demand remains weak. The Australian dollar rose, AUDUSD pair fell by 0.09% to 0.7537, while the NZDUSD pair fell by 0.46% to 0.7081, stabilizing after two earthquakes. USDCAD fell 0.21% to a nine-month high at 1.3571. USD index, which shows the performance of the US dollar against a basket of major currencies, rose 1.16% breaking 100 level, the highest since December 2015. Oil prices fell to a three-month low on Monday due to rising concerns of persisting oversupply and the weakness of oil prices in the next year, while the chances of an agreement on cutting production by OPEC members, by contrast, is melting. Futures for Brent fell by 1.23 per cent to 44.20 per barrel at the time of writing. Futures for WTI brand of American Mercantile Exchange in New York at that time were trading around the level of $ 42.86 per barrel, or 1.26 below the previous close. Members of OPEC will be trying to agree on a reduction or freezing output at the November rally of the cartel in Vienna. As a result of an informal meeting in September in Algeria, OPEC agreed to reduce production in the range of 32,5-33 million barrels per day. But analysts doubt the ability of the organization to conclude an agreement, especially considering that in October, OPEC has set another production record of 33.64 million barrels per day. 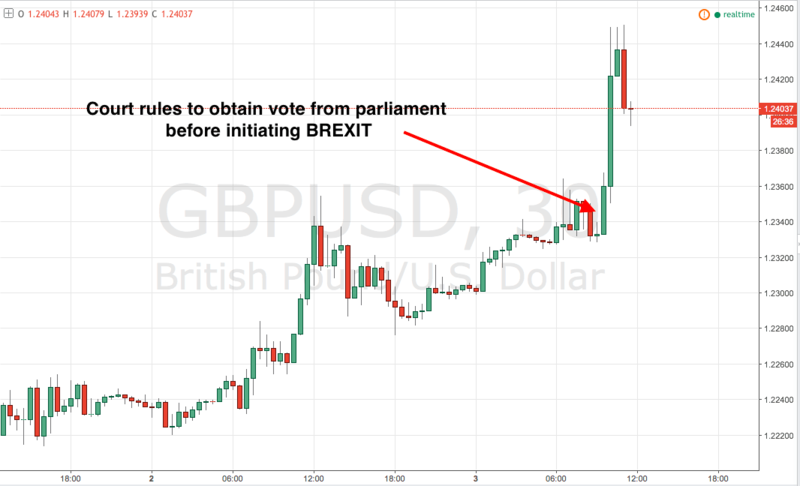 Support to the British currency was also offered by upbeat industry data released today and BoE rate decision which is expect to stand pat this meeting. Markit service PMI, one of the gauges of consumer inflation in UK rose at fastest pace since January. The sector expanded at 54.5 points from 52.6 in October. Consensus was at 52.4 points. The survey also showed that the weak pound had a marked increase in price pressure on the service providers in October. Inflation factors of production rose to its highest level since March 2011, the report said. Mark Carney, BoE head had extended its stay in the office as he would like to pass through complete Brexit process being at the wheel of the Central Bank. Earlier during his speech at House Lord Committee he hinted that plunging rates more could be a blow for falling Pound and further depreciation of the currency should be avoided. On Wednesday, Federal Reserve didn’t change its policy also hinted its needs “some” other evidence which supports rate hike. Probably FED waits for the US elections outcome as markets puts great importance on this event. US economy is close to FED targets and now markets price in about 80 percent of odds of rate hike in December. Chinese market rose after CAIXIN survey found signs of economic stability in the country; In addition, market sentiments were also propped up with the forthcoming introduction of the mechanism of cross-trading exchanges between Shenzhen and Hong Kong. CSI300 index consisting of blue chips rose 1 percent to 3.365,09 points, while the Shanghai Composite Index added 0.8 percent to 3.128,94 points. Earlier Thursday, CAIXIN report indicated the acceleration of China’s service sector growth in October, firming the confidence in stability of second-largest economy in the world. Purchasing Managers’ Index of Caixin / Markit (PMI) rose to 52.4 in October, taking into account the seasonal adjustment from 52.0 points in September, which was the highest level since June. Most sectors rose, led by the rise of the stock of infrastructure and financial sectors. Trading signals October 4. 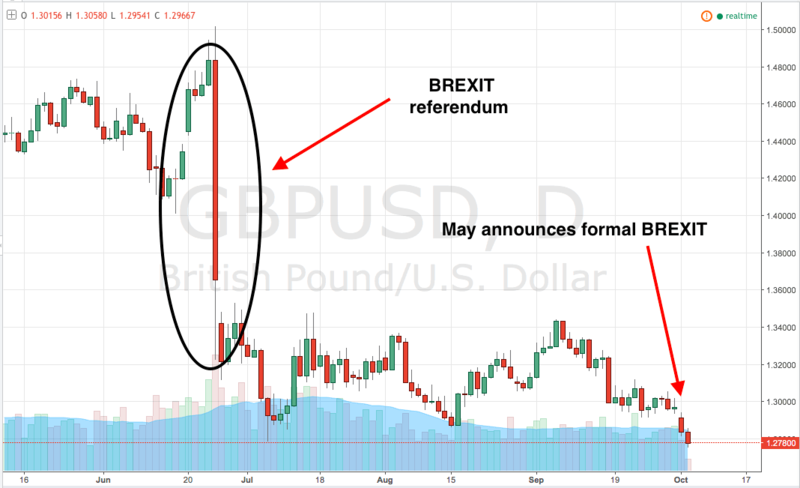 Brexit date and in to run-up to September NFP. Our Live Trading account where we trade based on my own market analysis. Let us know if you want to join for free. The Prime Minister noted that independent UK is likely to tighten immigration hinting on the so-called “Hard Brexit” version -although running the risk to lose access to EU’s single trading market. Being the export-oriented country losing EU market will be the tough blow to UK economy also weak pound makes up for this risk making the export more competitive and boosting revenues of the sector. Optimistic UK construction PMI index released today failed to transmit any optimism to the currency overwhelmed with the bearish sentiments as the main focus is on the details of BREXIT process. As we see only the “top of iceberg” in this story and there is a lot that remains unclear related to UK exit, Pound substantial recovery in the short-term outlook is quite unlikely. 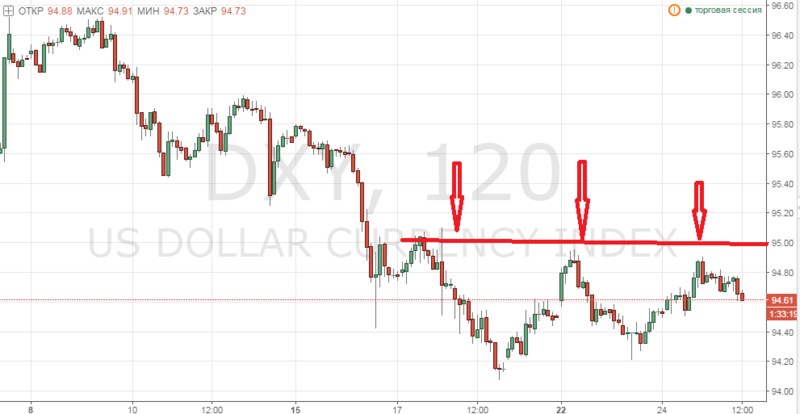 The currency will probably continue to head downside with a weak pullbacks from key supports with a next target to test 1.25 level. The bullion keeps losing from 26 September on Dollar gains amid Fed rate hike speculations which dampens yield expectation for the investors. Upbeat sentiments ahead of NFP were propelled by optimistic ISM Manufacturing report released on Monday, topping estimates. The report is also useful to assess current labor conditions so positive ISM also increases chances for good NFP figures. 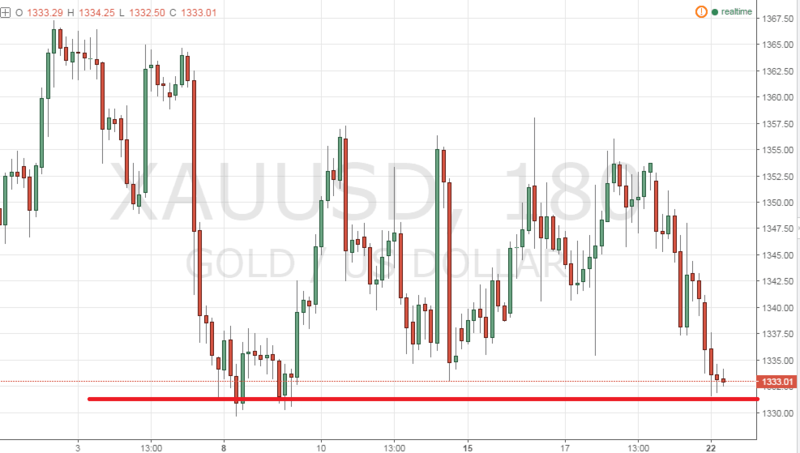 Rising greenback ahead of Friday employment report is likely to push Gold lower but considering it trades near three-month low and uncertainty related to NFP we can expect it to pare some declines returning to 1,330 area. Like and leave your comments if you want to receive daily free profitable signals based on my fundamental analysis! 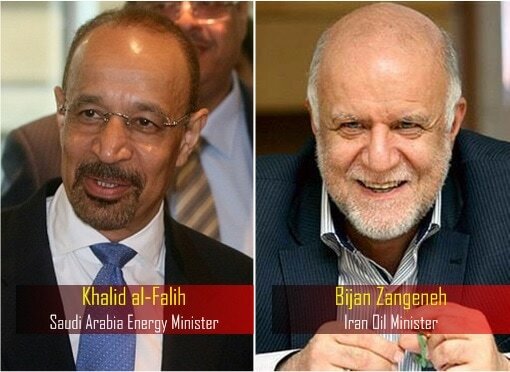 Minister of Energy of Saudi Arabia Khalid al-Falih and Iranian Oil Minister Bijan Namdar Zanganeh squashed the hopes OPEC and Non-OPEC producers will agree on production freeze during informal meeting in Algiers. Riyadh and Tehran are still at serious odds, said sources in OPEC. “The meeting is advisory in nature. We communicate with each other, listen to the views of the parties, including the secretariat of OPEC and consumers,” – said al-Falih. “It is still too early to make decisions we will try to reach a consensus in the run-up to the November OPEC summit in Vienna” – Zanganeh said. Persisting oversupply has cut more than double from the prices peak in 2014, forcing the OPEC and Russia to seek tradeoffs in order to rebalance the market, increase revenue from oil exports and thus to support the budget. Oil producers insist cutting supplies is essential for prices to go up, although analysts think that this measure will do little to cope balance supply and demand on the market. A source told Reuters last week that Saudi Arabia is ready to cut production provided that Tehran will join the agreement. Earlier on Monday, Iran’s oil minister said that the meeting in Algeria is purely advisory in nature, so won’t have significant outcome. Oil prices fell more than 1 percent at the end of trading session on Tuesday. Iran, whose production has stagnated at 3.6 million barrels per day insisted on an increase to about 4.1-4.2M barrels per day, while oil producers of the Persian Gulf, OPEC wanted Tehran to freeze output at the level not higher than 4M barrels per day, said three sources in OPEC. “We can’t expect anything until Iran finally doesn’t change its stance and support the freeze”, – said a source in OPEC, familiar with the negotiations. “Iran considers a fair recovery of production to the pre-sanction level. This has already been discussed, and more than once.” – Novak said. Al-Falih also said he is optimistic about the prospects for the oil market, despite the fact that its balance was delayed. “The market is moving in the right direction, slower than expected a few months ago, but the main indicators are in order”, – said Al-Falih. “Based on this, we are satisfied with the current state. I believe, we have achieved market balancing, it is just dragging on.”, – he added. According to his data, world oil reserves began to decline. 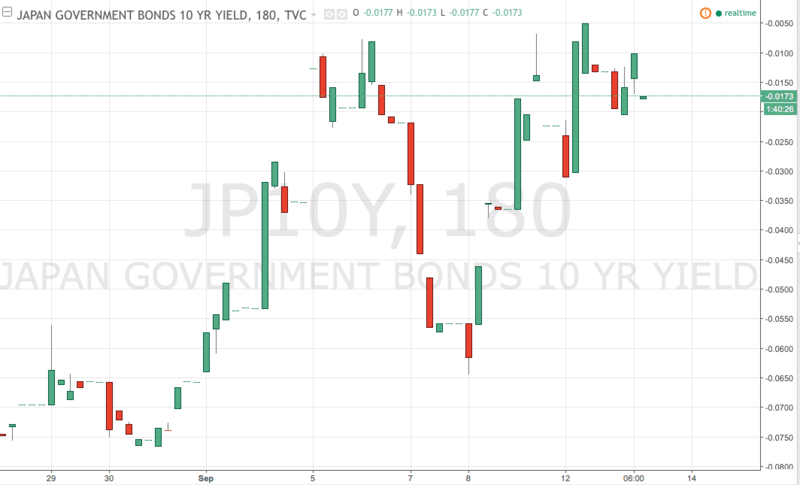 While traders all over the world are bracing for the rate hike decision due September 20-21 and BoJ Policy Statement on September 21, its important to take a look at preceding remarkable events which could be useful to follow market sentiment ahead of the Central Banks’ updates. A sharp drop in the service sector was a crushing blow for consumption-driven US economy, slashing chances for an early rate hike. 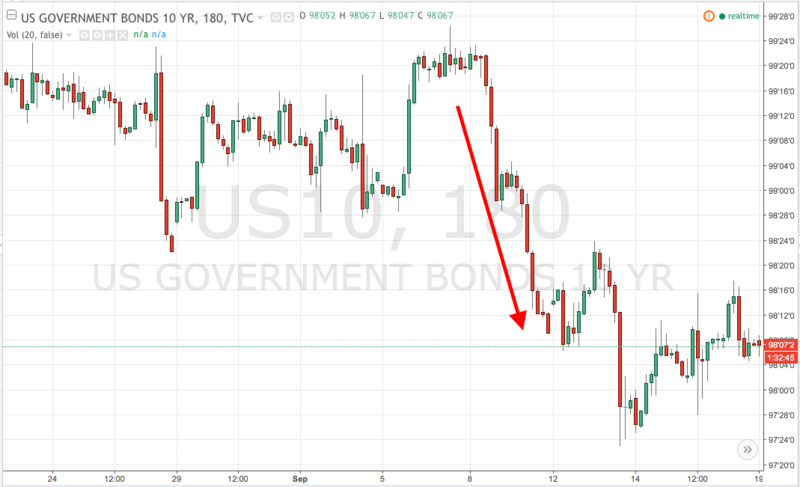 Uncertainty sparked pushing gold up government bond yields down. Later on September 8, the decision of ECB to not cut rates and leave asset-purchase program untouched signaled European Bank is done with easing for now taking wait-and-see stance. Such move put additional pressure on FED to delay rate increase as abrupt halting of stimulus from all Central Banks would be too painful for global equities which have been rallying on the rate cuts from Central Banks around the world. 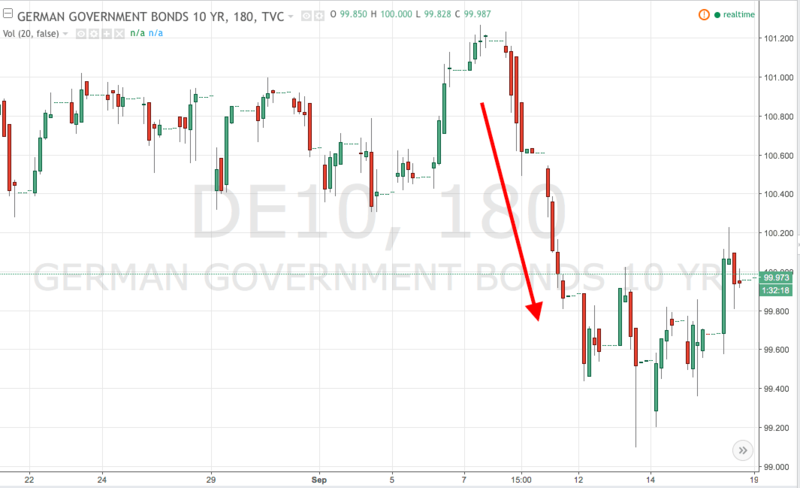 Government bonds also tumbled while their yield going up signaling investors expect no increase of borrowing costs from the FED in September. 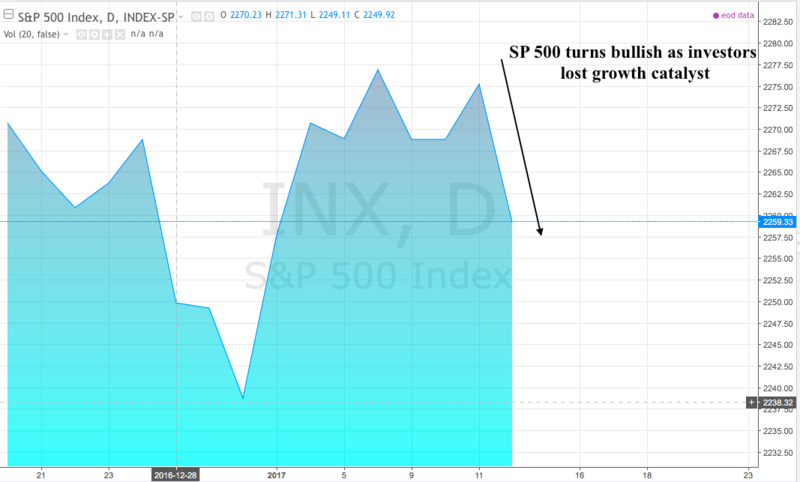 The rally seen on global stocks, which have been enjoying lax monetary policies from the Central Banks till recent time, will be probably extended. Nevertheless, latests data on Consumer Price Index which showed faster growth than projected instills confidence at least one rate increase will be done this year. The timeframe depends on how hawkish FED will be in its projections, but most probably it will take place in December. Futures on rate hike see more than 50% of Fed taking action in its last meeting in this year. The chart suggests that bearish force consolidates with potential break of $1300 level as investors expect extension of the period of “cheap dollar” till December meeting, getting out of safe heaven asset for higher yields. The pair has been declining for a third consecutive day reaching one-month low at 1.30. 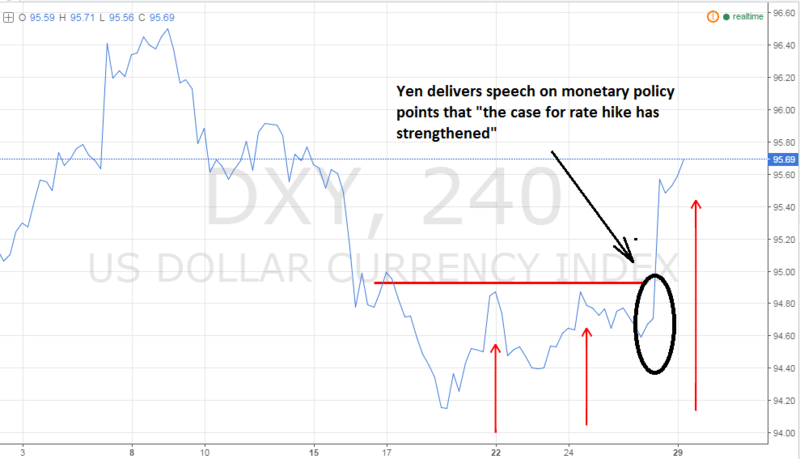 Tomorrow FOMC decision can potentially weaken the Dollar giving a perfect cause to the pair for a rapid bounce. Its strongly recommended to observe conservative risk setup and avoid trading with high lots and tight Stop Loss as wide volatility is expected on the markets. Leave your questions and comments in the box below. As the day of FOMC meeting is just around the corner and almost all market speculations boil down to the rate hike dilemma I would also like to add my two cents into this buzz. In attempt to predict the FED’s move it is useful to have a look at how “big money” prepares to the event. 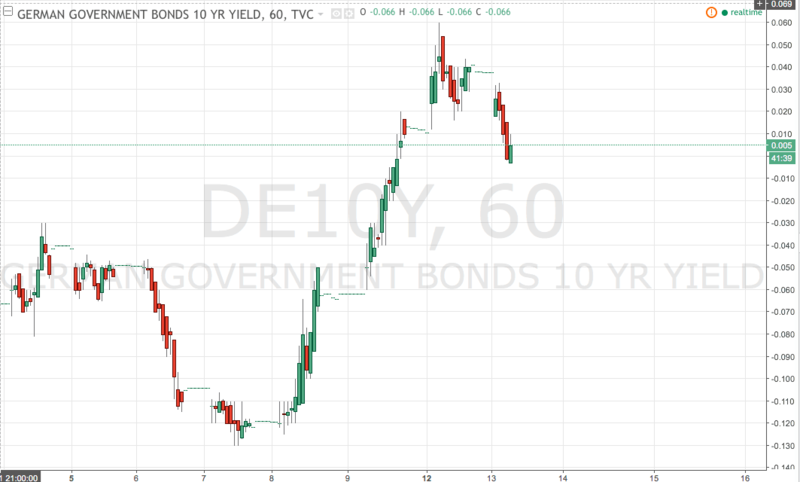 Government bond yields is a good indicator of investors’ sentiments as these securities are considered as one of the safest places to ride out market turbulence. 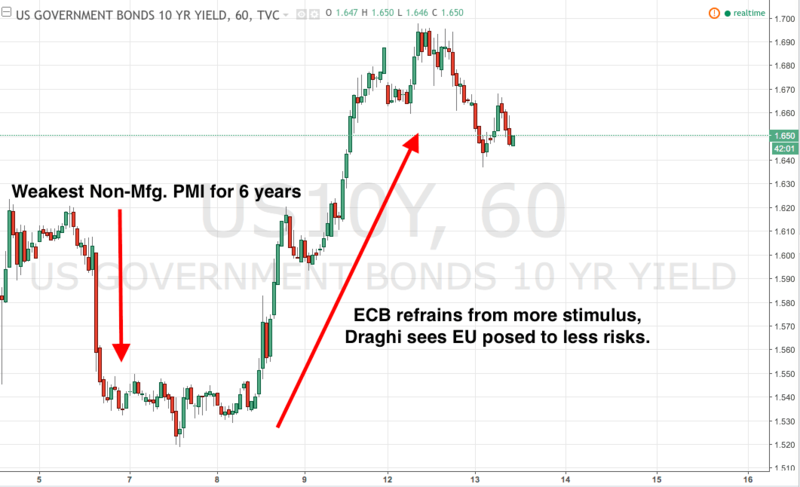 The relationship between bond yields and ” degree of panic” on the market is pretty simple: bond yields drop when the demand for government bonds increase (investors start to buy up them expecting recession or in case of increased market uncertainty) and rise when investors quit government debts switching to higher-yield assets in times of market buoyancy). As ECB delays boosting its stimulus program signaling the Central Bank plays down recession risks the FED may be urged to hike the rate sooner than expected as developing with low rates and full employment US economy risks to overheat. September odds was as high as 30%, halved after the FED Brainard stressed in her speech that “prudence warranted as hiking rates poses risks”. From the other hand, the hike odds priced in the federal funds rate futures are too low for the FED to act, so the rate will be probably left unchanged in September to avoid shocking reaction on the markets. If FED abstains from hiking rates, its likely to see a sharp drop in XAUUSD and boost in global equities. The bullion has a room for some more gains driven by uncertainty by in case of no change in FED policy it would have sense to bet on protracted decline. If you have any questions and comments leave them in the box below. 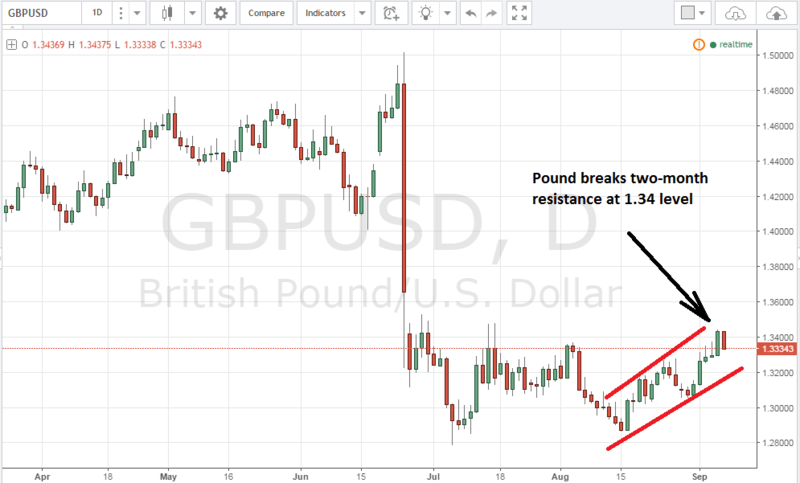 Update: both trading calls on Pound and Gold from my previous market commentary hit the mark! Check here for more info. So yesterday we got a fresh update from Institute of Supply Management (ISM) on business activity in non-manufacturing sector in US also known as Purchasing Managers Index (PMI). This indicator bases on the survey of leading purchasing and supply executives of the United States. Importance of this gauge is hard to overstate, considering that US economy relies heavily on domestic consumption rather than production. August data was particularly crucial as precise estimates on the state of US economy could help traders to understand FED plans on monetary policy tigheting. Basically the data was a key part of the puzzle named “September rate hike” and its lackluster headline figure could argue for the FED standing pat on its next meeting. The report showed that in August business activity in Non-Manufacturing Sector slid to the slowest pace of growth for more than 6 years, though remained in expansionary zone. Headline figure came at 51.4 points while analysts projected the reading at 55.4. Together with a slack in jobs data this paints a gloomy picture for the FED pondering over the timeframe for rate hike. Septembers odds have retreated from their peaks to 15%, December odds have also declined to 40.3%. Despite there is a slim chance the Fed will raise rate in September we can’t take this end off the table so uncertainty will keep driving the action on gold. As the summer holiday is over and FED meeting looms its hard to expect flat moves on Dollar. The currency is expected to trim down part of declines but growth should be limited. Later, closer to FOMC decision it is expected that investors will shrink their bets on greenback resulting in its decline. Pound has a good chances to extend rally as fears over Brexit consequences could be overstated. Recent economic updates proves UK economy fares quite well despite gloomy forecasts. And what are your forecasts on these pairs? Share your opinion in facebook comments! Trading signals for next week. August NFP review. US Labor department released yesterday its monthly account on the health of US Labor market. The report showed jobs growth averaged 151K, 29K less than medium analysts projection, almost twice weaker than in July (275K). Unemployment rose by 0.1% to 4.9%, while month-to-month change in wagers averaged 0.1%, missing 0.2% projection. 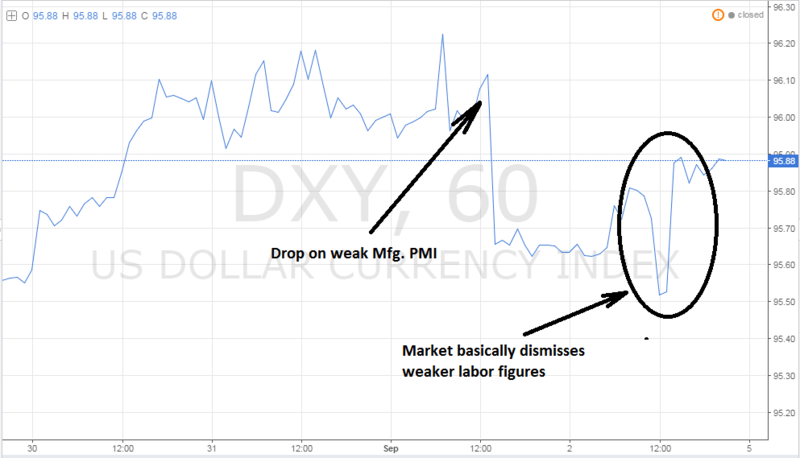 Limited response on weaker-than-expected NFP data could suggest that markets keep bullish outlook on US Dollar, expecting rate increase in September. For example Goldman Sachs analysts estimate September rate hike at 55% though other banks and investments firms are less optimistic on this case. 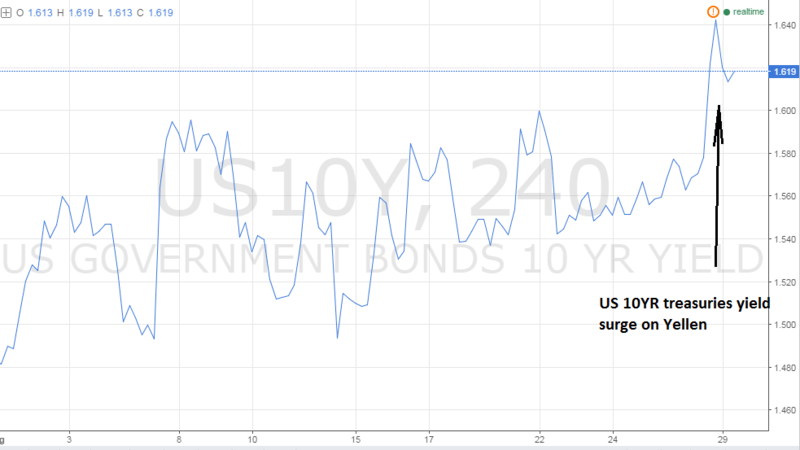 On US Bond market the yield on US treasuries fell reflecting lowered expectations on FED tightening in September while Gold also added in value sparking uncertainty on the markets. 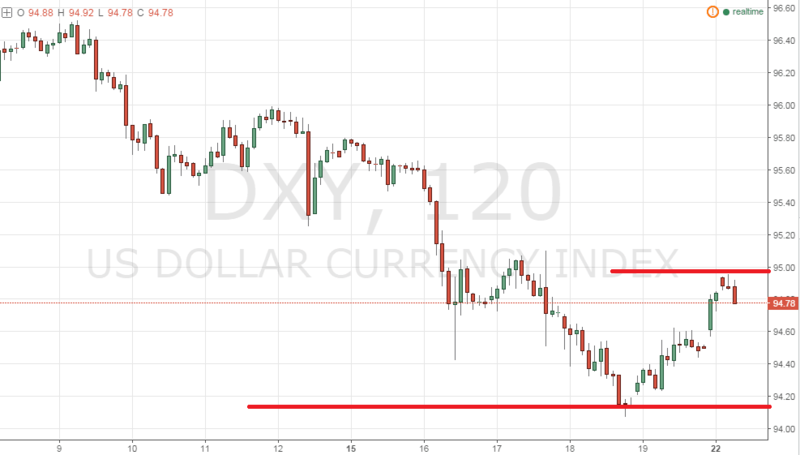 Based on this data, US Dollar is expected to extend retracement in the next week as large investors will start to adjust their positions and limit risk exposure according to a new data. US Fed’s Williams speech on Wednesday is also expected to bring some clarity on FED intentions, together with the FED Beige Book to be released same day. Although as the date of September FOMC meeting approaches it is likely to see a rebound on US Dollar as market outlook. 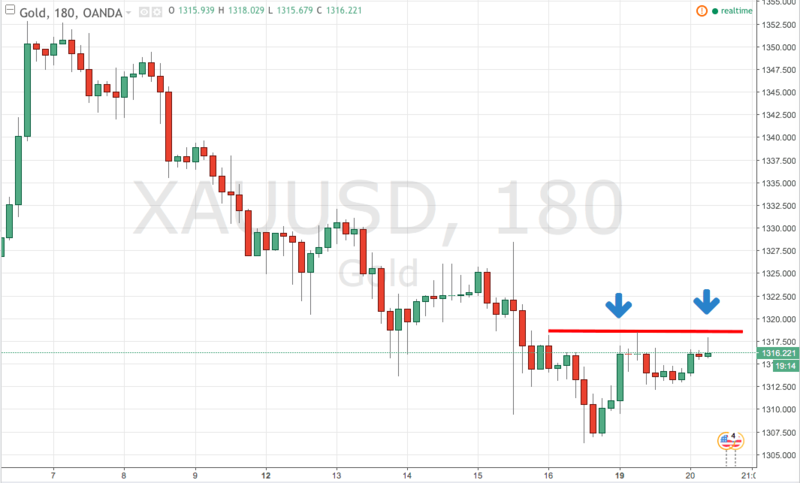 The bullion is expected to grow futher to $1,340 level where it meets two week resistance. So its preferred to open BUY position, lot size – 0.2 lot, TP $1,340, SL – 1,315.50. Leave your questions in the comment box. Trading signals 29.08.2016. Weekly Dollar outlook. Yellen’s key phrase “the case for an increase in the federal-funds rate has strengthened in recent months” mentioned in her speech basically allows to assume at least one rate hike is almost guaranteed this year. The confidence can be probably eroded only in case next payrolls and wagers data post extraordinary declines what is unlikely to break sustainable buoyancy on the US jobs market. Early rate hike is fraught with high stagnation risks if economy is not “heated” enough to develop further with high borrowing costs. Increased interest rate also hits earnings of large corporations as well as lead to a cutdown in investments to the low-yield assets. On a positive side, Fed intentions to tighten monetary policy improve projections on US economy growth in the long-term what will overlap potential negative medium-term impact on stock markets. As the FED rate hike becomes more or less certain in this year and could be already priced in in US Dollar, the question remains open if the central bank will go for a second rate hike. September rate futures estimate 33% probability of the increase while markets focus on August Non-Farm Payroll report which positive figures can boost the odds even more. The report is expected to extend positive streak so upbeat expectations will probably push greenback higher throughout the week. The pair will probably extend declines to 1.11 level on Dollar strengthening paring down monthly gains and will stall around support area till NFP release. Trading call: Sell EURUSD, Target – 1.1090, SL – 1.1255, Preferred Lot size – 0.4 lot. The bounce from 100 psychological support area has a good odds to be extended to 103.50 level. The picture on Gold remains quite mixed: on the one hand, bullion dropped to one-month support and has a good chances to pare down declines ahead of NFP uncertainty, but on the other strong Dollar can curb the growth. I would suggest to join bulls camp with a small lot, expecting rebound from support levels. 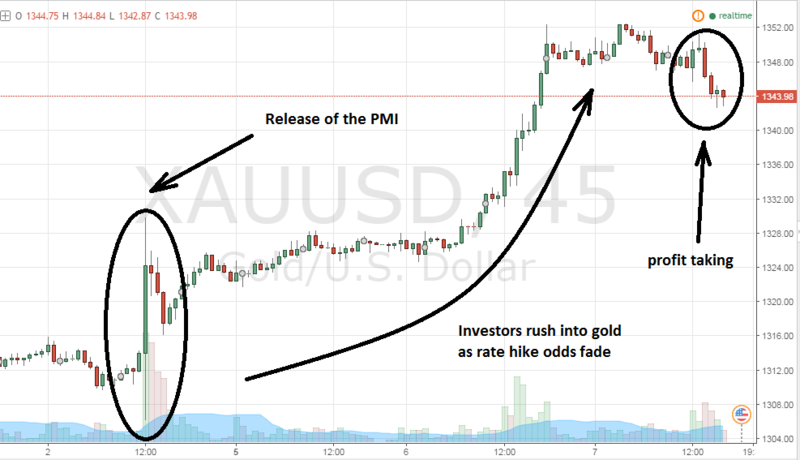 Trading call: Buy XAUUSD, Target – $1,340, SL – $1,305. Lot size – 0.1 lot. That’s all for today. Looking forward to see your comments and questions in facebook box. Leave your email or whatsapp number if you want to receive free daily forex signals and analytics! European currency pared down advance against greenback after release of mixed Eurozone PMI, though sentiment on US Dollar remained fragile on the eve of FED Janet Yellen speech on Friday. EURUSD pair retreated from 1.1355 level, Tuesday session high, slowing down decline near Monday close at 1.1320. 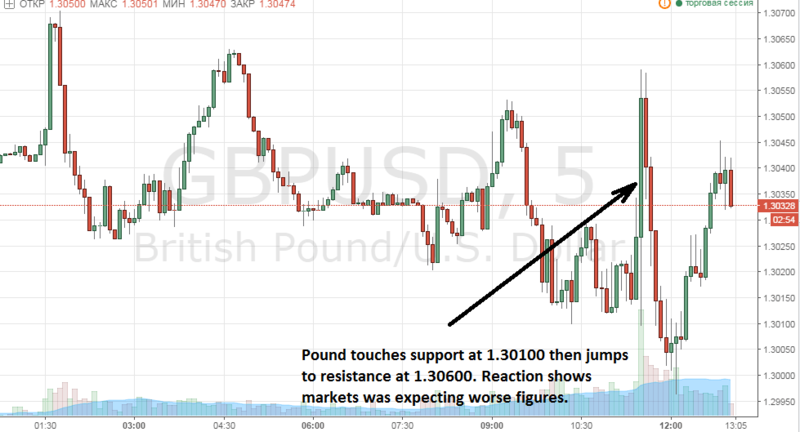 The pair’s support and resistance is seen at 1.1268 – 1.1370 levels. Earlier on Tuesday, research group Markit reported that its gauge of business activity in the manufacturing sector in Germany rose in August to 53.6 from 53.8 in the previous month, breaking expectations for a decline to 53.5 points. Services PMI in Germany fell to 53.3 this month from 54.4 in July, while analysts’ consensus predicted the gauge will remain unchanged. Markit also reported that the index of business activity in the manufacturing sector in France dropped in August to 48.5 from 48.6 last month, compared with growth expectations to 48.8. Business activity in service sector in France rose this month to 52.0 from 50.5 in July, beating expectations which anticipated no change in the index. For the entire eurozone, the preliminary value of the composite index of business activity, which combines activity in the manufacturing and services sectors, rose to 53.3 in August from 53.2 in July. The indicator climbed to the seven-month high, while analysts expected a drop to 53.1 points. Meanwhile, the dollar remains under pressure as investors keep reduced bets on US currency on the eve of speech of the Chairman of the Federal Reserve Janet Yellen on Friday which is expected to make fresh signals on the timing of the next interest rate increase in the United States. 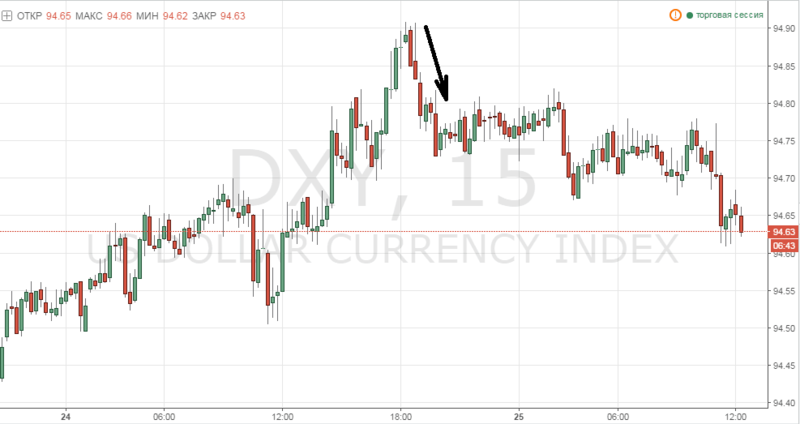 The US dollar generally strengthened after the Federal Reserve Bank president on San Francisco John Williams last week gave a hint of a rate hike in September. The euro fell against the pound, with EUR / GBP pair losing 0.26% to 0.8596. FED Vice Chairman Stainley Fischer said in his interview on Sunday that US economy is close to arrive at its key economic goals – full employment and 2% inflation, fueling speculations Rate Hike can be in the pipeline. The New-York Fed governor William Dudley said last Tuesday FED may raise rates as soon as in September, although futures for interest rate price in only 18% of increase on next FED meeting. FED head Janet Yellen will speak in Jackson Hole on Friday which expected to provide more clues about FED stance on the Rate hike. GDP (annualized) and Advance goods Trade Balance figures core economic gauges will be also released on Friday helping to estimate how well US economy fares. As it seen from the chart the currency found resistance near 95.00 level though its now difficult to determine whether it is a true bounce from resistance or we see global bullish bounce from 94.00 running out of steam. I suggest to focus on 95.00 level, if greenback manages to cut through it then it will probably get a “green light” to extend rally; closing Monday session below 95.00 level would be probably a signal to take bearish side on US Dollar. But key focus remains on Friday Yellen speech which is expected to help US Dollar to win back some of its last week losses. Pound started near 1.3050 after a row of strong and relieving economic updates released last week, jumping to 1.3090 during London session. The pair is expected to find strong resistance at 1.31 level so the intraday signal is SELL, TP 1.3030, SL 1,3110. Preferred lot size – 0.2 lot. The pair is expected to extend declines as 1.13 level is not likely to present an easy cliff to climb. The Bullion fell last week, as low expectations of the rate hike in 2016 contributed to the outflow of cash from safe heaven assets and growing bets on emerging market assets. 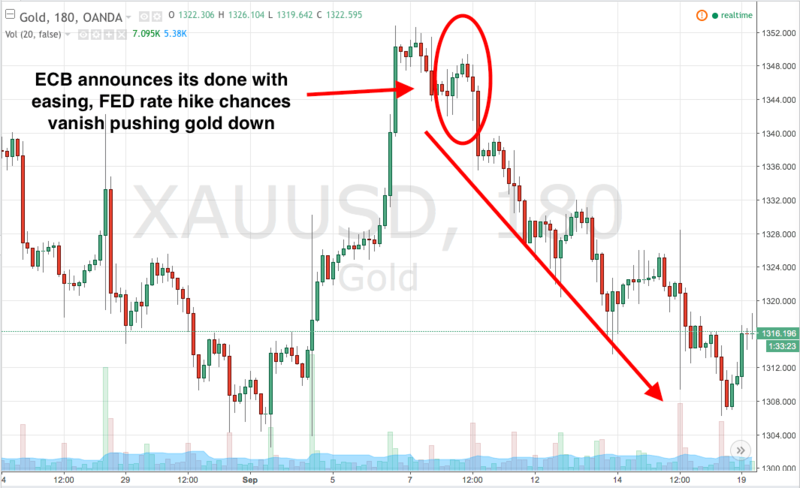 The uncertainty related to the Yellen speech this week will probably force investors to limit their risk exposure, so moderate upturn on gold is expected. 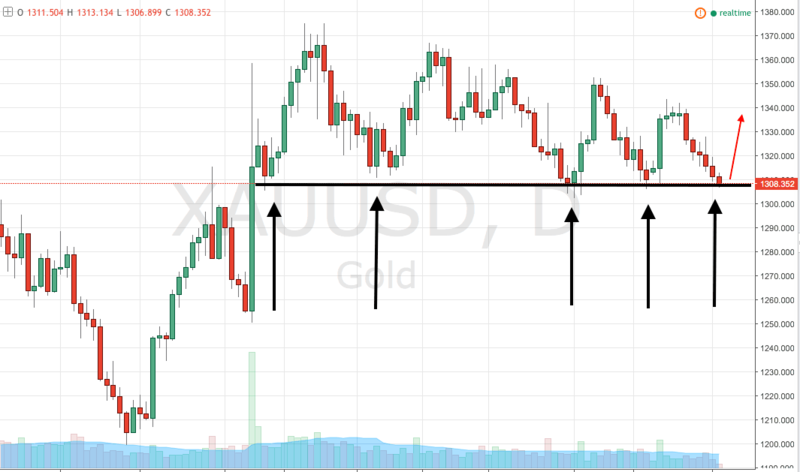 It could be a perfect time to bid on gold as it now approaches to its two week support level as it seen from the chart. Stay up-to-dated with Brokerarena to receive daily signals and fundamental analytics. Feel free to leave your questions and comments in comments box! Greenback stages rebound after finding floor at 94 level on Thursday, yet trading near eight-week low against the euro and may show weekly decline against other major currency rivals as the July FED Minutes showed that the policy makers are in no hurry to raise rates. Janet Yellen, the head of Federal Reserve is expected to lean towards extended period of cheap borrowing costs in her speech on next week dampening appeal of the dollar for investors. The dollar index walked away from yesterday lows and trades near 94.42 level (+0.32%). On Thursday, the index dipped to 94.077, the worst performance since 23 June. Fed officials continue to pursue their notion about “data-dependency” in calculating future monetary moves, though they were generally optimistic about the outlook of the US economy and the labor market. The president of the Federal Reserve Bank of San Francisco John Williams stressed that he was not in favor of a rate hike in haste, but warned that the pace of economy growth could get out of control if rates stay low for too long. Meanwhile the Head of Federal Reserve Bank of New York William Dudley said that stable employment and return to the labor market of job offers with average level of salaries argue for upturn in the US economy, saying Rate hike could happen as early as in September. Data on Thursday showed that the number of US citizens applying for unemployment benefits has declined substantially than expected over the past week, propped by the views of labor market stability. Euro fell 0.33 percent to $ 1.1315 as Dollar upturn gains speed. The Australian dollar was down 0.57 percent to $ 0.7642. Greenback saw a fresh wave of selloff on Wednesday as publication of Minutes of July FED meeting revealed an overwhelming bias of the Central Bank to extend period of low borrowing costs in order to spur global growth. Futures on US currency traded at 94.31 level in London session on Thursday, lowest since 25 of June. EURUSD rose 0.25% to 1.1317, trading near two-month high at 1.1332 reached on Wednesday. 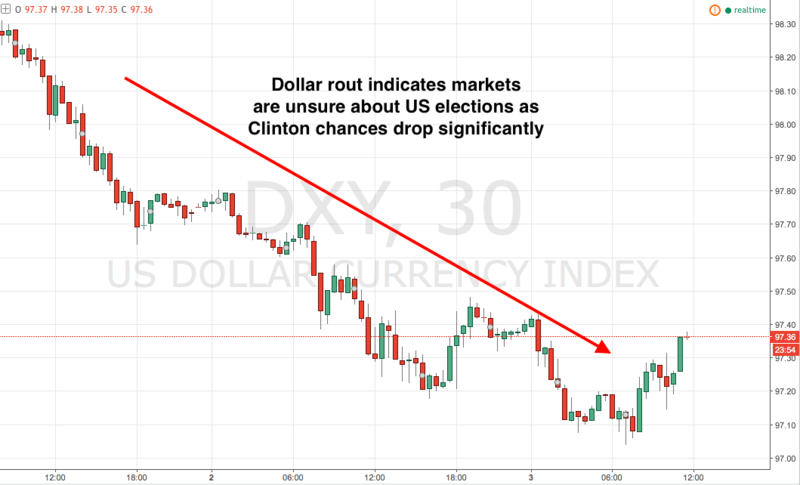 The dollar remained under pressure after July FED Minutes showed that officials are at variance whether to raise rates on coming minutes with majority of members voting to hold off the hike. The report states that some members expect that economic conditions in US will soon fit monetary tightening while other part of policymakers preferred to leave their political choice open. In the euro zone, data showed that consumer price index fell in July by 0.6% compared to the initial estimate of growth of 0.2%. In annual terms, the CPI rose 0.2%, in line with expectations. 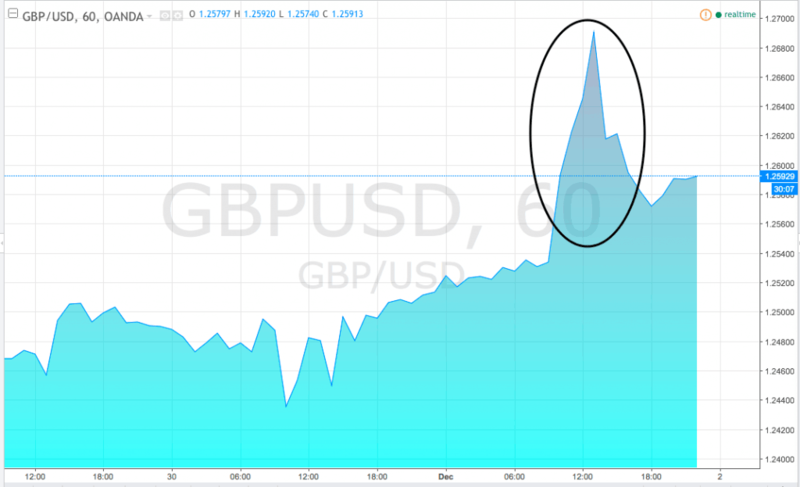 GBP / USD pair grew by 0.88% to nearly two-week high of 1.3154. Sterling strengthened after the Office for National Statistics reported that the volume of UK retail sales rose in June by 1.4% compared to the previous decline of 0.9%. Analysts have been way off the mark with their projections, expecting only 0.2% growth in June. In annual terms, retail sales increased by 5.9% after 4.3% in June. The consensus forecast had predicted an increase of 4.2%. The Core index of retail sales, excluding car sales, increased during the month by 1.5%, after falling in June by 0.9%. Analysts had predicted an increase of 0.4% last month. Australian and New Zealand dollars strengthened, AUD / USD pair retreated 0.44% to 0.7689, and the pair NZD / USD gained 0.30% to 0.7274. Earlier Thursday, the Australian Bureau of Statistics reported that the number of employed persons in the country increased in July to 26,200, while the expected increase of 11,000. The unemployment rate fell last month to 5.7% from 5.8% in June. Analysts expected no change. The pair USDJPY trades almost unchanged at 100.30, near a six-week low of 99.52 reached on Tuesday, while the pair USDCHF fell 0.32% to 0.9595. Pair USD / CAD fell 0.21% to 1.2818, trading close to a six-week low 1.2793 on Tuesday. Commodity currencies are supported by the rebound in oil prices after data on Wednesday showed a surprise contraction in US inventories last week. Pound tests local resistance at UK unemployment data but fails; European equities fall. Meanwhile, European stock markets continued to decline. London’s FTSE 100 index lost 0,15%, Euro Stoxx 50 fell 1.01%, France’s CAC 40 fell 0.67%, while Germany’s DAX weakened by 0.71%.